Will HappiJac Tiedowns void my truck manufacturer's warranty? Absolutely not. This is a competitor-originated myth and rumor. Most manufacturers’ warrantees do not cover truck beds from the factory at all. This is clearly stated in the warranties of Ford, Chrysler Dodge, Chevrolet and GMC that truck beds are considered exceptions and are not a factor in valid warranty claims. HappiJac's Tie Downs are specifically designed to reduce, not increase, the stressors on your truck bed and frame. They are also the only tie downs featured in Ford's official RV and towing guides each year. What application fits my truck? An interactive tie down selection guide can be found if you scroll above. Where can I buy the Happijac camper anchors? Camper anchors can be bought through local dealers throughout the US, Canada, Europe and Australia, or directly from HappiJac's online store. To find a dealer in your area, use the dealer locator on our home page or under the customer service link above and follow the instructions. How much do HappiJac Frame Mount Tie Downs cost? Do I need to use a stabilizer bar? What payment methods does Happijac accept? Happijac accepts Master Card, Visa, check, or money order. Happijac’s Qwik-Load™ Turnbuckle saves campers time and effort so they can spend less time setting up equipment and more time enjoying it. The lightning fast lever-action makes installation easy and tension can easily be adjusted after installation. Qwik-Load™ is available as an integrated Turnbuckle from the factory or as an upgrade to Happijac's original Turnbuckles (or any turnbuckle based on a ½-inch threaded rod). Features a stainless steel body and reinforced 1/2" solid steel round hook (as found in the standard Happijac turnbuckle, FM-TB) which can easily support 4000 lbs per turnbuckle. 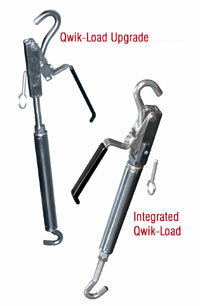 The Qwik-Load turnbuckle design allows traditional turning of the turnbuckle for tension adjustment after installation. There is no need to release Qwik-Load turnbuckle in order to achieve perfectly tuned tension. Simply attach the hooks to the camper and tiedowns as usual and clamp down into place in a single quick action. Soft, ergonomic removable handleFeatures a rubber cushioned handle for comfort, insulation against extreme temperatures and increased operational leverage. Its high profile handle ensures that users will never smash their knuckles against the turnbuckle when locking down. Handle can be detached for storage and to prevent theft. 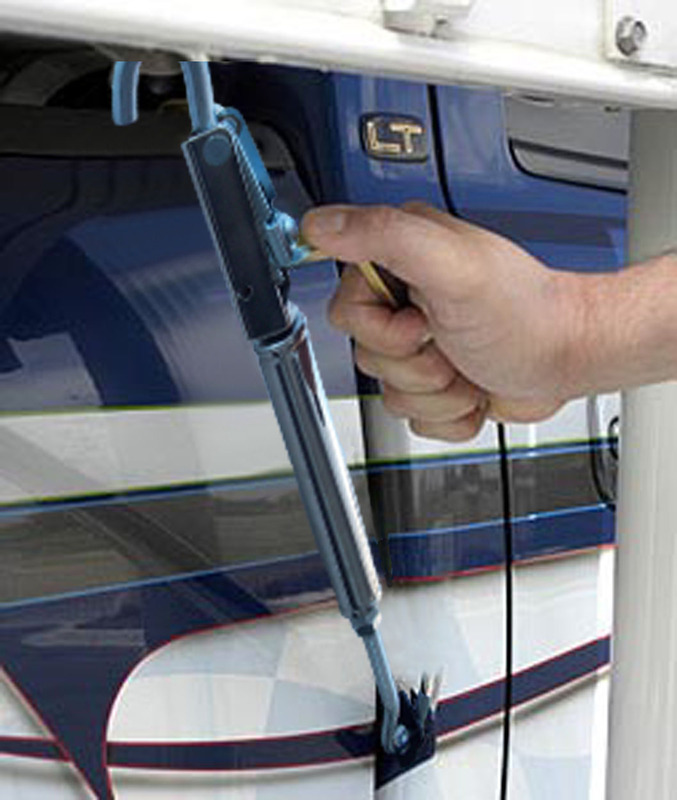 Locking pin keeps Qwik-Load securely in place while on the road and can quickly be pulled for fast removal and storage.